The name "Tasmanian devil" (Sarcophilus harrisii) may reminds you of the ferocious character from cartoons, but these native Australian marsupials are 100 percent a reality. The nocturnal, meat-eating animals live solely on the island state of Tasmania, true to their name, although they once were a pretty common sight throughout Australia. Tasmanian devils only live in Tasmania, which is situated just off the coast of the southeastern Australia mainland. The marsupials roamed the mainland until they died out roughly four centuries ago, according to Tasmania's Department of Primary Industries. The mainland extinction of Tasmanian devils may be a direct result of the increasing prevalence of dingoes and a progressively dry environment. Tasmanian devils were especially widespread throughout the southern portion of mainland Australia. Tasmanian devils are relatively common throughout Tasmania, and live all over the island, especially in its northwestern and eastern regions. Some common settings for the animals include coastal moorlands, woodland forest underbrush, wooded rural areas, scrublands, rangeland and rainforests. The nocturnal species often frequents areas that have a lot of human beings -- think outer suburbs of towns. This may be due to the animals' food-scavenging tendencies. Tasmanian devils, like many other animals, establish dens for retreat purposes. They usually create these in burrows, stony caverns, amidst thick vegetation or in the middle of wooden logs. During the daytime, Tasmanian devils remain in an inactive condition known as "torpor." Torpor is similar to hibernation in that it helps the furry creatures save valuable energy. When Tasmanian devils are in torpor, they stay put inside their cozy dens. 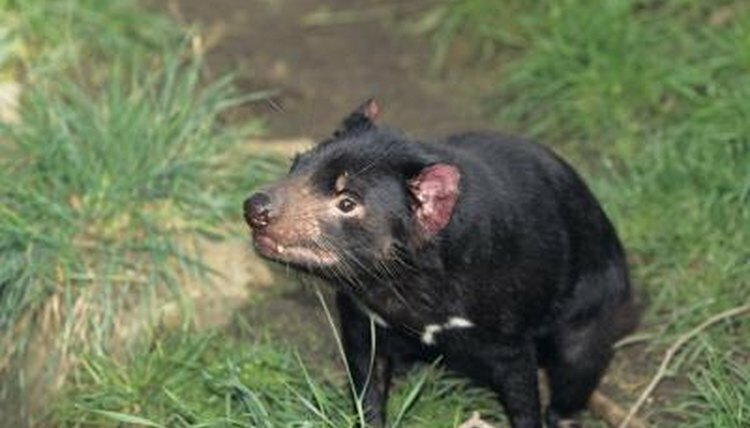 Since the end of 2008, the Tasmanian devil species has been classified as endangered, according to the IUCN Red List of Threatened Species. As of 2006, the population of Tasmanian devils dropped by more than 60 percent from a decade before. The animals have full protection from the Australian federal government. Many factors are associated with the declining population of the marsupials, including trapping, hunting and even the spread of an extremely dangerous and deadly ailment known as devil facial tumor disease. Loss of habitat, however, isn't as big of a threat to Tasmanian devils as it is to many other animals, according to the Save the Tasmanian Devils program. The marsupials can travel to new locations with ease and are very adaptable to diverse varieties of vegetation.